Today we’re proud to announce the rollout of “Sandbox Environments”. What we’re trying to solve: we want to give you a safe place to experiment and test changes in your apps, without disrupting your Production apps - both on web and on mobile devices. We understand how apps are getting more and more complex, so we wanted to give you some tools to help you manage the risks inherent with making changes to complex applications. This feature is only available for super admins. We have plans to allow others into Sandboxes in the future, but for today we are only allowing super admins. When you create a Sandbox, you are creating a copy of your entire account, including all apps and data (except audit records). There are no changes that you can make in Sandbox that will impact your Production applications. We have safeguards in place to ensure this. Where do I access Sandboxes? To enable Sandboxes in your account, you’ll first need to talk to your account rep to have the feature turned on. They will be able to walk you through pricing models and figure out the best plan for you. 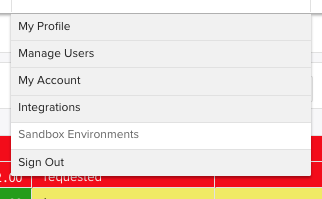 Once the feature is turned on, you’ll be able to access Sandbox Environments from the Account menu. How do I create a new Sandbox? Its easy. As a super admin, you’ll just need to click on the “CREATE A SANDBOX” button, and the system will email you once the Sandbox has been created. How long it takes will depend on the size of your account. How do I sign in as another user into a Sandbox? When you click on “Launch Sandbox” link under the name of the Sandbox you want to access, the system will present you with a list of users. Click on the user you would like to sign in as, and a new tab will open in your browser and sign you in as that user. When you’re done, you can either sign out, or just close the tab. The experience on mobile is similar. On Android, you can access Sandboxes from the Application menu, and on Apple devices, you access Sandboxes from the Settings menu. On either device, just tap on the name of the Sandbox you’d like to launch, then choose which user you’d like to sign in as. When you sign out of the Sandbox on mobile, you will be auto-signed into your original account. Can I refresh the data in a Sandbox? Can I update a Sandbox with changes from Production? No. When you create a Sandbox, you are creating a snapshot of your account. The data will not be refreshed, nor will any subsequent changes made in your Production apps be reflected in your Sandbox. To refresh data in a Sandbox, you can simply delete the Sandbox and create a new one. Your Sandbox Environments do not yet support API access (they will in the future). When you create a new Sandbox, we will disable all notifications and scheduled shares. If you would like to create new ones you can do so. If you change or delete data in a Sandbox, it will not be reflected in Production. If you add a user to your account, they will not be allowed to access any Sandboxes that were made prior to their account creation. If you disable a user account in Production, you will not be allowed to sign into a Sandbox as that user. “Sandbox” is part of a larger set of features under the umbrella of Application Lifecycle Management (ALM). ALM is an industry term that represents the lifecycle of an application, from inception through the various stages of development, testing and deployment. Lots more detail in the knowledgebase - we hope you enjoy!